A drug addict accused of shooting dead a businessman in a botched burglary has said he was not involved because he was a "drunk and a liability". Scott Keeping told Winchester Crown Court he was only arrested because a car key was found in his possession linking him to the burglary. 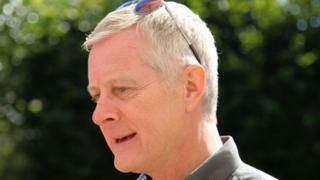 Guy Hedger, 61, was killed in the raid at his home in Ashley, Dorset, in the early hours of 30 April. Mr Keeping, Jason Baccus and Kevin Downton all deny murdering Mr Hedger. Giving evidence, Mr Keeping said he had been arrested because he was a friend of Mr Baccus and was "a hundred zillion billion percent" sure that he was not in the car during the raid. He said he had not been told anything during the alleged planning of the burglary: "I am an alcoholic. They aren't going to tell me because I could go into a crack house and tell everyone. "I am a liability. There was no discussion in front of me whatsoever." The trial has heard that Mr Keeping told a fellow inmate and a prison officer at Winchester prison that he had joined the raid to pay for his drug habit. But the 44-year-old told the court he had been misunderstood. Diamond jewellery and watches were among items stolen in the burglary at the property near Ringwood. The trial previously heard how Mr Hedger was shot as his husband, Simon-Pierre Hedger-Cooper, activated a panic button. Mr Baccus, 42, and Mr Keeping, 44, both of Verney Close, Bournemouth, and Mr Downton, 40, all deny murder, possessing a firearm, aggravated burglary and burglary. Helen Keeping, 40, from Poole, denies two charges of assisting an offender.